SEE WHAT’S HAPPENING WITH DL HUGHLEY! 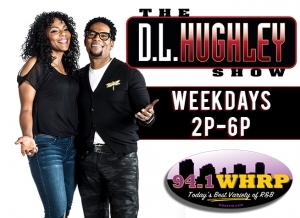 THE DL HUGHLEY SHOW airs weekdays from 2p-6p CST on 94.1 WHRP! Famed comedian, actor, host, and television personality DL Hughley has stated that he’s “very excited to get back to radio and it couldn’t have come at a better time. “I think radio fits my sensibility. I want to be fast, I want to be funny, I want to be topical. I want to make people laugh a lot and think a little. Some people want to push the envelope – I want to see if I can singe it a little,” and this team is set to help him keep afternoons moving. Jasmine Sanders, a popular media personality, has been seen nationwide on BET/Centric is co-host of the network’s show Culturalist. Sanders established herself as a prominent personality on New York’s WWFS 102.7 and also at WBLS hosting the top-rated midday show. BET describes her as being, “…known for her infectious personality and for her knack to make even the most private celebrities feel comfortable. She makes everyone, from listeners to guest feel like their listening to a friend.” As the recipient of various career achievement awards including being named at the top of Girl’s Incorporated’s “Most Influential Women” list.